A double square design and geometric carving distinguish this sterling silver and gold Star of David pendant, handcrafted in Yemenite style. The wide square outer frame is embellished with diamond grooves and six-petaled flowers at the top and base. A smaller square of oxidized silver fits inside the larger silver frame, hinged at either side, allowing a narrow space between the two sections of the pendant. 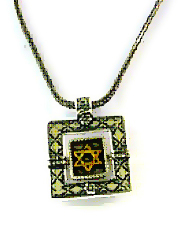 Fine Yemenite-style beaded decoration in polished sterling silver edges the inner square. A small Star of David in 14 karat gold is overlaid on the dark oxidized silver background.